Decisions that are made in Washington D.C. often affect the experiences we have in our classrooms in Philadelphia. As apart of the Alliance for Educational Justice we work with community organizing groups from across the country to impact national education policies. Below are some highlights from our national campaign work. 2008 – present: PSU became a founding member of the Alliance for Educational Justice, a national alliance of youth and parent organizing groups working on the national level to impact federal educational policy. One of our core issues since our founding has been ending the “school to prison pipeline” (policies and practices in our schools that push students directly into the criminal justice system). Partly as a result of our efforts to build relationships between directly affected students and federal policy makers in the Department of Education and the Department of Justice, those two agencies combined forces to create the Supportive School Discipline Initiative in July 2011, which will look at how federal policy can be used to end the school to prison pipeline. Russlyn Ali of the DOE’s civil rights division credited the Alliance for influencing her office to expand their data collection efforts. From 2010-12 PSU was the Program and Base Building Anchor organization. May 2011: PSU took 100 students, parents and community members from Philadelphia to Washington DC for the National Rally and March for Youth Investment. This was calling for the creation of a National Congressional Youth Caucus and increased Federal investment for youth jobs. September 2011: In coalition with the Alliance for Educational Justice, 25 PSU members went to Washington, D.C. to participate in a press conference to applaud the creation of a national grassroots youth caucus. 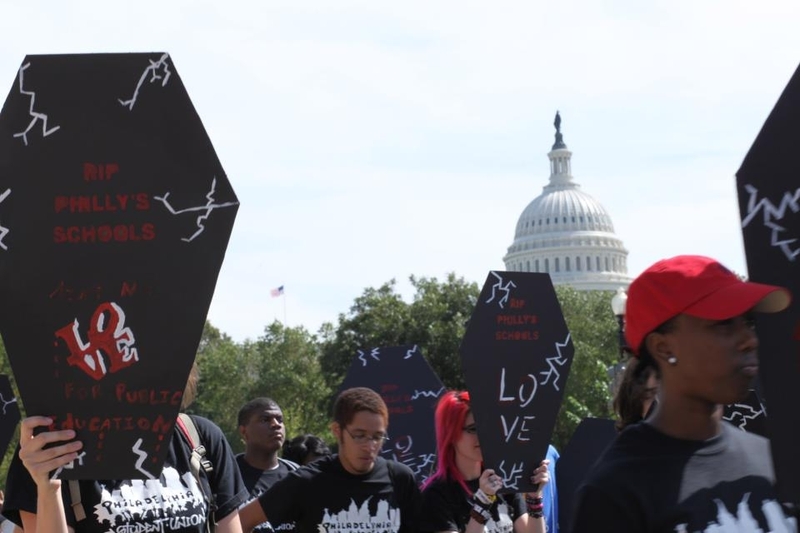 May 2012: PSU members, as part of the Program and Base Building Anchor of the Alliance for Educational Justice, helped coordinate a march/rally in Washington, D.C. that engaged 100 parents, students, and alumni in our national work. This event demonstrated to our members and allies the importance of advocating for public education reform at a local, statewide and national level. September 2012: PSU co-founded Journey For Justice (J4J) a national coalition of youth organizing and community groups calling for a national moratorium on school closings. On Sept. 20th, 2012 J4J met with the National Department of Education, Congressional Black Caucus and the Office of Civil Rights. The Office of Civil Rights is investigating the possible Civil Rights Violations caused by widespread school closings. DOE committed to doing an impact tour of cities experiencing school closings.